Some might consider this one of the best shows to ever be made, others don't agree. Everyone has their own opinion and I personally love this show so much that it's the only show I've rewatched. I watched it about 3 times by now and I'm sure I'll watch it again in the future. I love the story, it's so different from anything I've seen. The characters are amazing and you'll fall in love with them for sure. The show follows the life of a few high school (later on college) students from New York City and their glamorous lives as a blogger called "Gossip Girl" follows their every step. This is a very recent find and I'm so glad I decided to watch it. I wasn't very fond of it in the beginning but I didn't give up and kept watching it and by the end of the first season I already considered it one of my favourite shows ever. It involves fantasy and supernatural creatures so if you're not a fan of that, maybe skip this one. The characters are super fun and the storyline is unpredictable and gripping. The show follows Clary's discovery of her shadowhunter fate and her friends' and family's ups and downs while fighting an evil mastermind. Unfortunately, this is a show that is about to end as well. It has been cancelled and we won't be getting an ending but it's still worth watching. It's based on historical facts so if you're not into that then this isn't for you but I personally love history and I've watched Reign since it started. I'm gutted that it's gonna end but hopefully, this will open doors for many other historic shows that I will certainly watch. The show follows the journey of Mary, Queen of Scots, and her tough life in France and later on Scotland. It involves love, power, and a few funny moments that make the show worth watching. If you haven't heard about this show then you've probably been living under a rock. The new season has just been released and I haven't had time to watch it yet but I can't wait to do it. This show follows the life of a few inmates at a female prison. It touches important subjects like racism, sexism, homophobia and transphobia while still being a great comedy. Definitely, recommend it. Comedy shows are some of my favourite kind of shows to watch. They're fun, quick, and get me in a great mood every time I watch one. Modern Family is definitely one of my absolute favourites. The show's about a big modern family, as the title suggests, constituted by three intertwined families. It follows the Dunphy's (Claire and Phil and daughters Haley, Alex and son Luke), which are a "traditional" family, Mitchell (Claire's brother) and Cam, a gay couple with a sassy daughter and Gloria and Jay (Claire and Mitchell's dad) that are a family composed by an older man with a younger woman and her son Manny (and later on their son together, Joe, sorry for the spoiler). The show is shot in a reality show kind of way which makes it super different and original. This is another comedy that I absolutely love. This has already ended but it's not because it was cancelled, don't worry, there's an ending to it. The show is about how one of the main characters, Ted, met his kids' mother. The show goes as he tells his kids about how he met their mother, telling them about all the girlfriends he had previously and the fun and things he did when he was younger, alongside his friends Lily, Marshall, Barney and Robin. This is another comedy that I recently discovered and I'm so glad I did. It's so fun and I absolutely love Mindy's humour. The show is about an OB/GYN called Mindy Lahiri and it follows her quest to find love while having a few dramatic situations. And these are all of my favourite shows. 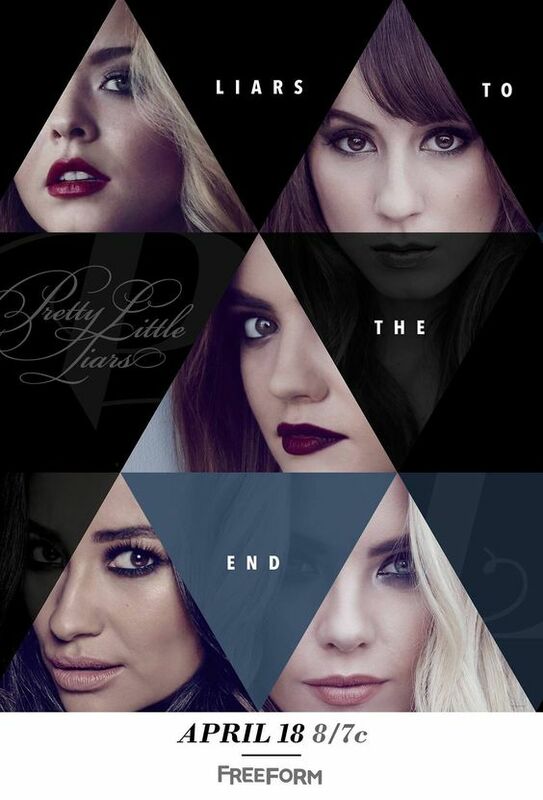 If you haven't watched PLL then definitely give it a try and if you watched the beginning and didn't like it, don't give up on it because it changes a lot throughout the seasons and gets better and better. Sadly, it's over but everything good has to come to end someday, right?